Tasteful, intimate stylings. Understated or hard swinging. Danceable grooves. Foot-tapping beats. All this and more. 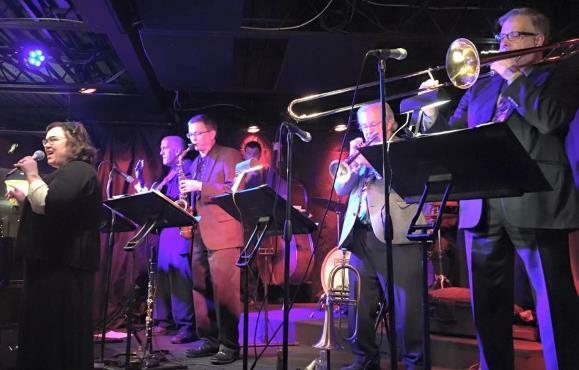 When you want the best in swing entertainment, you want THE TWIN CITIES SEVEN... a true swing band that delivers a musical message without annoying amplifiers or overdone theatrics. Natural sound is the forte of this group. You'll enjoy top quality musicianship as you listen to authentic swing music delivered in the style of the finest swing groups in the history of jazz - Count Basie, Duke Ellington, Louis Armstrong and Billie Holiday to name just a few. The band released its first CD "I Swing.. .Therefore I Am" in October of 2000. This CD was met with critical acclaim, and was followed in 2001 by a collaboration between the band and Charmin Michelle on Charmin's CD, "Hot". In 2004, the band and Charmin recorded a short CD titled "Welcome Home" as part of a fundraising project for Larry Madson, "The Jazz Realtor." All proceeds from "Welcome Home" went toward the Twin Cities Habitat for Humanity project. Since 2015, the band has been working with vocalist Maryann Sullivan, a local songstress who came into singing later in her life after a stellar career as a radio broadcaster. Maryann will be remembered by many as the successor to Leigh Kamman upon Leigh's retirement from Minnesota Public Radio. Maryann brings new material to the TC7, and a fresh approach to the vocal department of the band. Such music requires a sense of ease, command and confidence. It's gotta sound both lazy and lively, lived-in and fresh. Alto saxophonist/clarinetist Haining, along with his crack crew...has zero trouble getting the feel of the deal. Customers who hire THE TWIN CITIES SEVEN are always happy at the end of the engagement. Whether you're planning an intimate gathering of friends, a wedding reception or a major corporate event, THE TWIN CITIES SEVEN will provide just the right touch, from quiet background music to a complete showcase performance.